Antes de valorar el vestido en sí, quería contaros su anécdota. 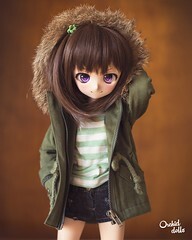 Lo compré en la tienda online de Luts por enero de este año. Todo fue genial, son majísimos, un trato de 10. Lo único es que sólo envían por EMS, pero bueno, “no pasa nada”, me decía, “va a caer en aduanas, pero como es un valor bajo simplemente llegará a casa, le pagaré los aranceles y demás al cartero y ya”. Pues bien, el paquete llegó en abril. ¿La causa? Paquete extraviado. Tres largos meses de llamadas a aduanas cada semana, enfados, intentos de devolución, reclamaciones… Lo peor es que no te puedes poner en contacto con alguien que sepa lo que ha pasado realmente. ¿Cómo se pierde un paquete de EMS? En fin, toda una odisea. Es probablemente la parte del hobby que más odio y creo que muchos comparten mi opinión. 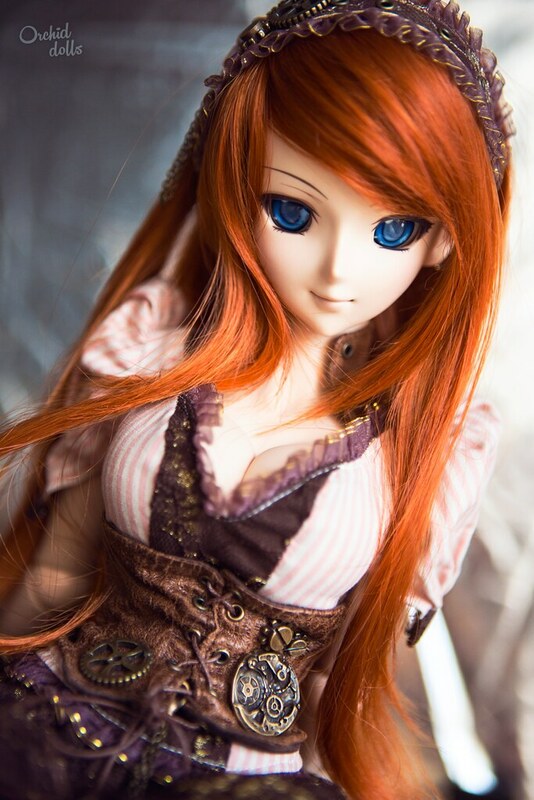 Before reviewing the dress itself, I want to tell you its little story. 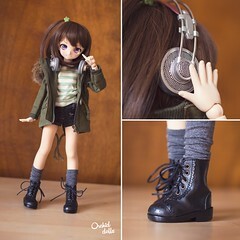 I bought it at Luts online store in January this year. Everything was great, they’re really nice and the treatment was excellent. The only thing is that their only shipping method is EMS, but well, “no prob”, I said, “it will go through customs, but as it is a low value package, it will arrive home, I’ll pay tariffs and other payments to the postman and that’s all”. Well, the package arrived in April. The cause? Package got lost. Three long months of calls to customs each week, anger, attempts to return, claims… The worst thing is that you can’t get in touch with someone who knows what really happened. How does an EMS package get lost? Absolute torture. It’s probably the part I hate the most in this hobby and I think many share my opinion. Rage mode off, siento la parrafada pero lo tenía que soltar xD De todas formas, entre una cosa y otra, no he podido disfrutarlo mucho hasta ahora, han sido unos meses intensos. 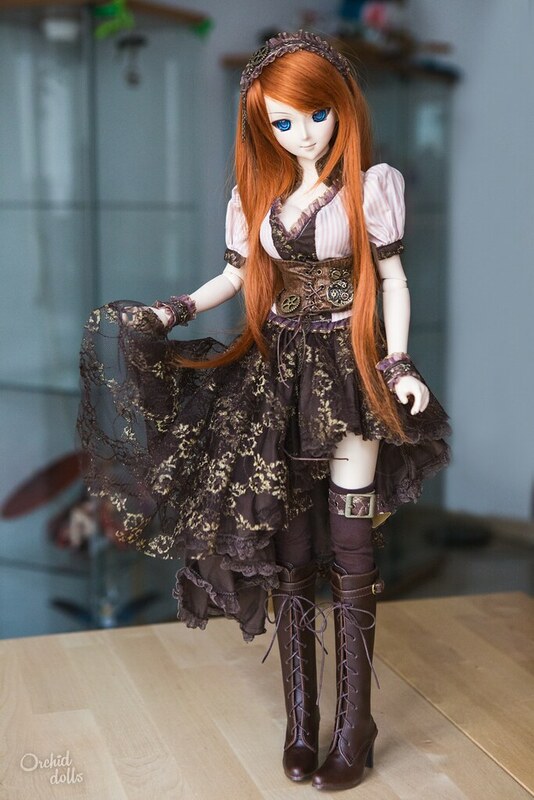 La dueña indiscutible del vestido es Yuuko que, al no haber mucha prenda steampunk suelta a la venta, se tiene que nutrir de sets enteros. Rage mode off, sorry for that but I had to tell you lol. Anyway, I couldn’t enjoy this outfit till now, these last ones have been few intense months. 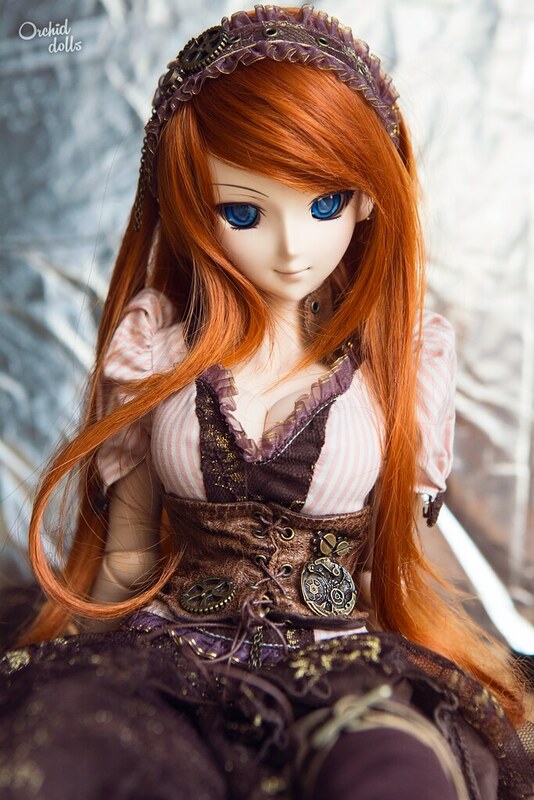 The undisputed owner of the dress is Yuuko, as there aren’t really many steampunk garments out there and I have to buy entire outfits. 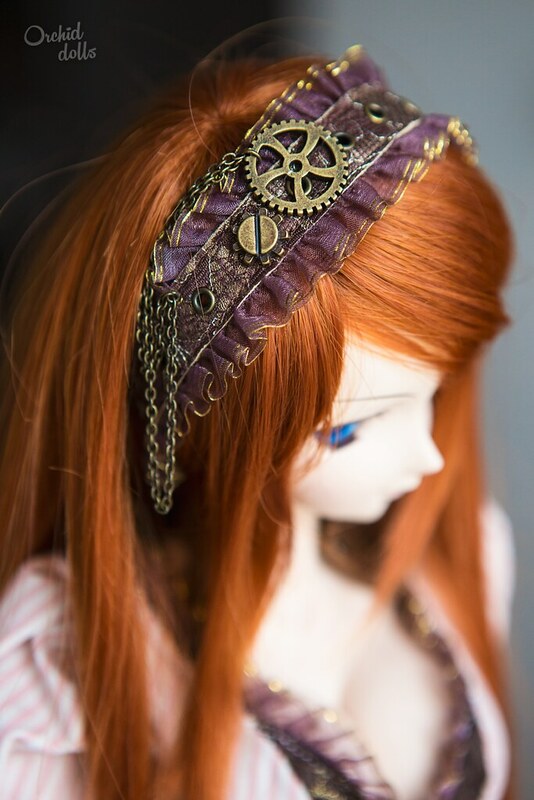 El traje trae un montón de accesorios y me encanta, es parte del encanto del steampunk. En total son 10 piezas, de arriba a abajo: turbante, collar, camisa, corsé, 2 muñequeras, falda, liguero-cinturón y medias. Se trata de un traje para Senior Delf de Luts, y es bueno saber que le vale a una DD, pero ojo: el busto de tu DD debe ser L o más grande. En cambio el corsé lo he tenido que ceñir al máximo e incluso se podría cerrar más, así que en comparación a las SDF, las DD tienen menos cintura. 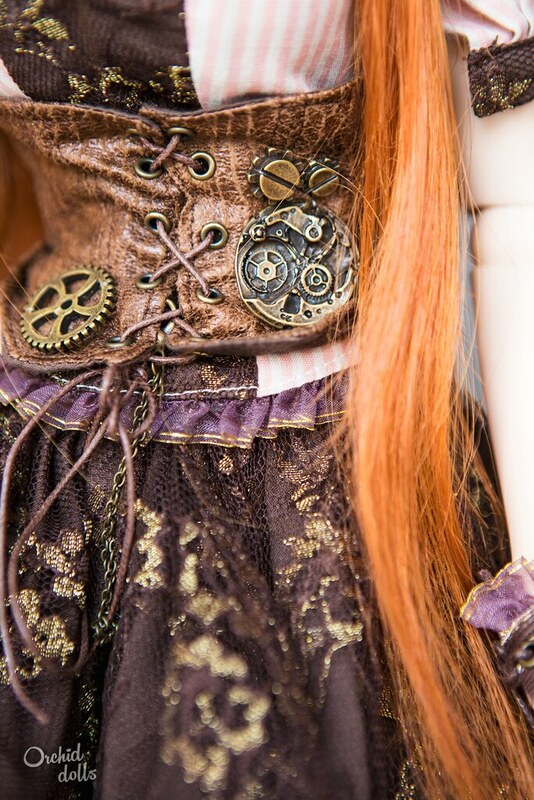 This outfit brings a lot of accessories and I love it, is part of the charm of steampunk. 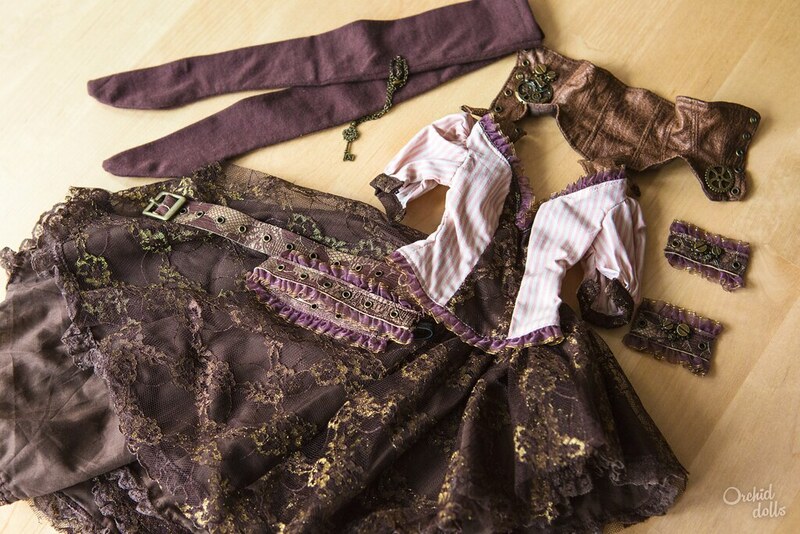 A total of 10 pieces, from top to bottom: headpiece, necklace, shirt, corset, 2 bracers, skirt, garter belt and stockings. 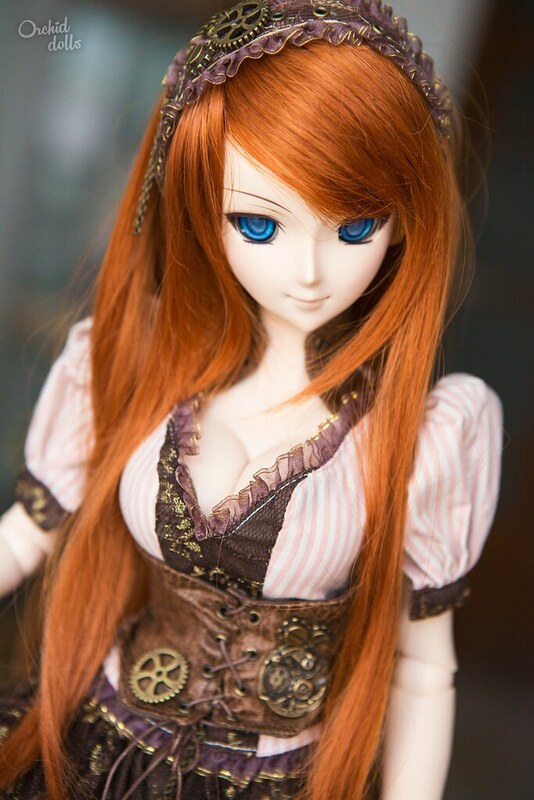 This set is for Luts’ Senior Delf, and it is good to know that it can fit DD, but beware: the bust of your DD must be L or larger. 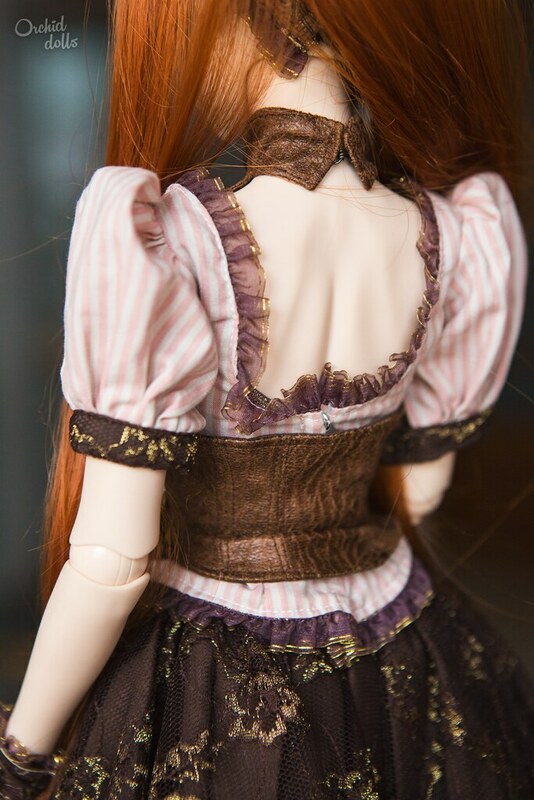 Furthermore, I had to close her corset to the maximum and it could even be smaller, so compared to the Luts SDF, DD have less waist. 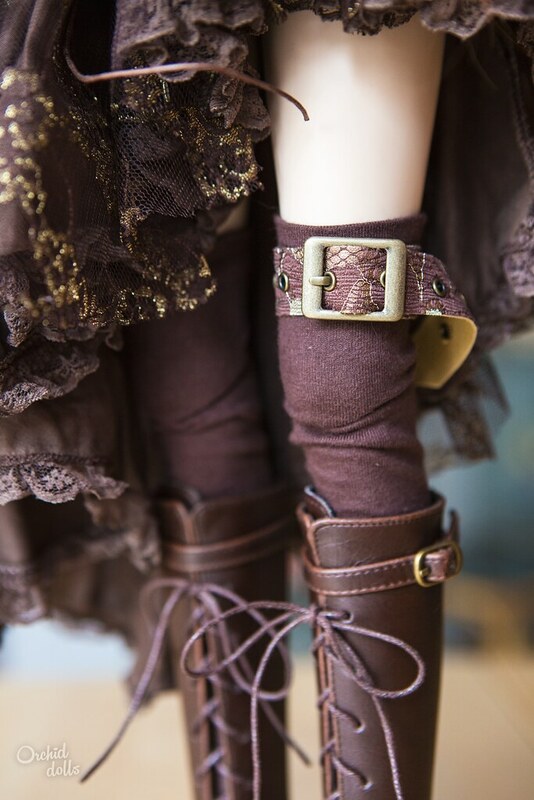 Too bad about the shipping drama, but …Wow that’s an awesome outfit, the design is great with cutout at the front and the back ^^ I like dark brown with the faint purple shade, frills, texture and the little brass parts complete the overall look. 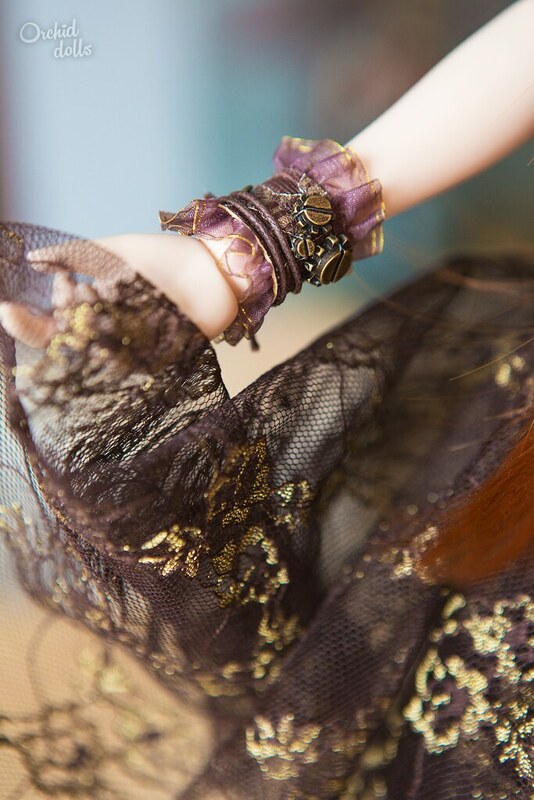 I really love the headpiece *kyahhh* ;D I’m not really a steampunk person, but it’s a style Dolls can wear perfectly.